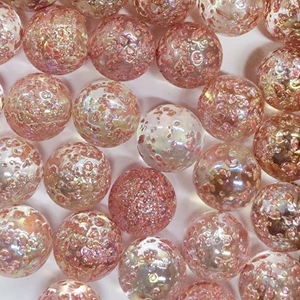 These Red Stardust (AKA Princess) Cobbles are clear with textured flecks of opaque red on the surface. They are iridized to have a highly shiny reflective surface. These marbles come in packs of 12 or 100 marbles. They are approximately 22mm or 7/8" in diameter and usually range between 20 - 23mm in diameter.